The Timeline Followback (TLFB) is a semi-structured interview that retrospectively measures a person’s alcohol consumption. It can used instead of daily diaries/real time reporting, if participant dropout or funding is an issue. In this research study, we aimed to determine if the TLFB was a reliable measure for retrospectively assessing caffeinated alcoholic beverage use and its associated outcomes. If the TLFB was found to be reliable, we wanted to know if consuming CABs was associated with more risk than consuming alcohol on its own. 189 participants, with an average age of 19 years, who had consumed alcohol in the past 90 days were included in the study. The TLFB interview was modified to include questions related to CAB consumption including duration of drinking episode, level of perceived intoxication and experience of negative alcohol related consequences as a result of intoxication. Participants were also asked about their caffeine consumption within 30 minutes and during consumption of the alcohol. The modified TLFB reliably measured CAB use, although it was a bit less reliable when assessing alcohol mixed with energy drinks. We also found that CAB use was associated with consuming more alcoholic drinks, spending more time drinking, reaching higher perceived blood alcohol concentrations, and experiencing more alcohol related consequences than drinking alcohol alone. 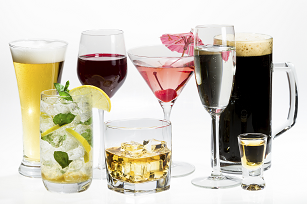 Drinking occasions that involved alcohol mixed with energy drinks incurred the most risk and these occasions were associated with greater caffeine quantities than non-energy drink CABs (e.g., a rum and Coke®). The modified TLFB can be used in place of daily diaries for CABs use, which should support less participant dropout and will require less funding when undertaking research. As perceived blood alcohol content was higher for CAB occasions than alcohol-only occasions, future research should examine the validity of the masking hypothesis, which asserts that caffeine causes people to underestimate their blood alcohol content.